Pregnancy is not a time to diet or try to lose weight as it can lead to the poor growth and development of your baby. The amount of weight you gain is influenced by your diet, activity level and overall health. How Much Weight Should You Gain? Use Health Canada’s pregnancy weight gain calculator to calculate your pre-pregnancy body mass index (BMI) and see what a healthy weight gain is for you. Where Does the Weight Go? 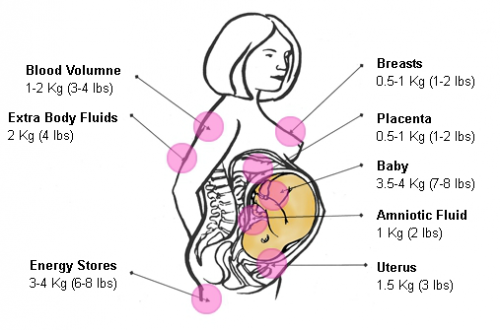 Most women need to gain about 25 to 35 lbs (11.5 -16 kg) in pregnancy. It’s common to gain very little weight in the first trimester. In the second and third trimesters a gradual increase of about 1 lb (0.5 kg) a week is normal since the baby and supporting tissues continue to grow. See your health care provider if you notice weight loss, no weight gain or a lot of weight gain especially if it’s sudden.